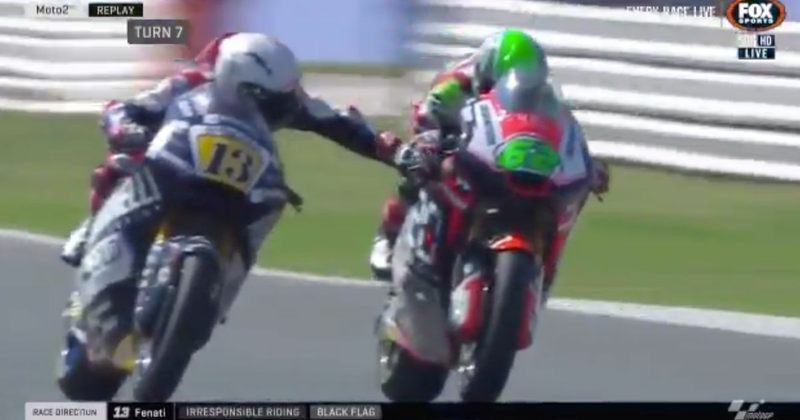 After he outraged the bike racing world by grabbing the brake lever of rival Stefano Manzi’s Moto2 machine, there were calls for Romano Fenati to be permanently banned from the sport. Instead, MotoGP officials went with a two-race ban - on top of his disqualification from the San Marino Grand Prix. Although now, Fenati has effectively been kicked out of the sport. “After the disgraceful episode between Romano Fenati and Stefano Manzi, it is impossible for the team to maintain its planned collaboration with the rider from Ascoli for the 2019 season. Fenati - whose actions were in retaliation to Manzi running him off track during a messy overtaking manoeuvre - posted his own statement. “I want to apologise to everyone who believed in me and all those who felt hurt by my actions,” he said. In 2016 Fenati was kicked out of Valentino Rossi’s Sky Racing VR46 Moto3 team for apparent “behavioural issues,” while back in 2015 the rider made headlines for the wrong reasons by kicking Niklas Ajo during the Argentine GP warm-up lap, before switching his competitor’s bike off on the grid.